Home / #FRIENDStvseries #comedy / Television / The Best F.R.I.E.N.D.S. Ever! I love comedy. Who doesn’t? It’s a rest and relief from the troubles and trials of life. Some comedies give you relief but some takes you into another dimension. 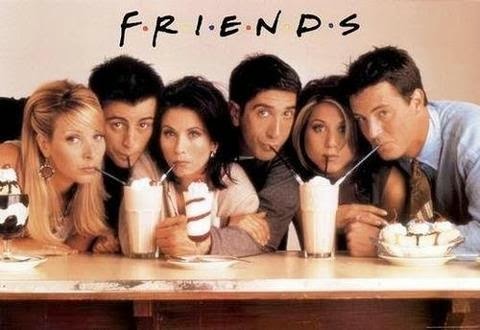 The classic comedy series F.R.I.E.N.D.S. has been a worldwide sensation and since I saw it in college, a little more than 10 years ago (shocks! My age! ), it has been my go to DVD collection during those days I wanted or needed a little pick-me-up. It’s a great series to get your mood up and even help you achieve that neutral California accent that could get you a lot of favors. It could literally keep you awake at night. The series has lasted for 10 long seasons that all seemed hanging and made you want for more of them. It’s the first of any series to last that long and people are still asking for more, even a movie! From season one to the end, you’ll love and hate the six main characters and get emotionally involved with all the things that are happening in their lives—all six of them and their families. You’ll smile and laugh out loud at their crazy and awkward moments and you’ll cry at their heart-warming moments. It’s easy to identify with at least one of them because you must have experienced one of their life events. All these fun-filled stories have been a part of your life. They celebrate Thanksgiving every year and every single year, something bad always happens and sometimes a lesson in life comes in. The fun part is they usually have famous Hollywood stars as guests. The six main characters tend to grow into you, albeit they have dysfunctional personalities because in this day and age, who isn’t? All the actors are perfect for their roles and have given justice to the character they are portraying. Monica, the glue that holds them all together, owns the big apartment where majority of the episodes are plotted. The relationships that grow between and among them add confusion and more awkward moments but make a really good and realistic story. A little exaggerated for the screen but a lot more feasible than most TV series out there. Without bias, I can truly say that it’s the best comedy TV series. Although it may depend on your appetite for satire and situational kind of comedy, it is funny as long as you understand the story and the script. For being the standard of comedy series today, it deserves a five out of five stars!